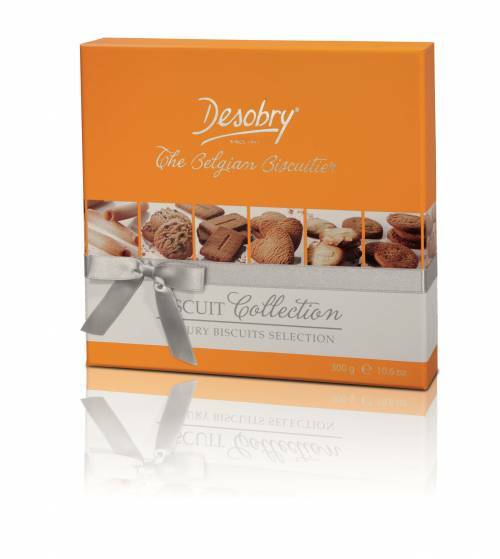 A biscuit assortment with Belgian biscuits with a range of non-chocolates biscuits. Theses treasures are displayed in a beautiful orange box. Wheat flour, sugar, oils and vegetable fats (palm, rapeseed, copra), butter (milk), whole eggs, soya bean flour, almonds, inverted sugar syrup, chocolate chips (cocoa mass, sugar, dextrose, emulsifier : soya lecithin), dextrose, egg whites, salt, skimmed milk powder, raising agents (sodium carbonates, diphosphates), hazelnuts, wheat starch, natural flavours, natural vanilla extract, emulsifier (soya lecithin), cinnamon. Store in a cool, dry place.